Vehicles will continue to operate with safety drivers. Other companies -- including Waymo, Uber, Lyft and several others -- have offered limited taxi services with safety drivers. This service is mainly different in its polish and level of development -- or at least that's all we have been told. They only say they "hope" to expand it to people outside the early rider program soon. They have loosened it a bit -- the riders no longer need to sign an NDA, and they can even bring friends along for rides, which I am sure will be popular. In other words, Waymo has missed the target it set of a real service in 2018. It was a big, hairy audacious target, so there is no shame or surprise in missing it, and it may not be missed by much. There is a good reason for missing the target. The Uber fatality, right in that very operation area, has everybody skittish. The public. Developers. Governments. It used up the tolerance the public would normally have for mistakes. Waymo can't take the risk of a mistake, especially in Phoenix, especially now, and especially if it is seen it came about because they tried to go too fast, or take new risks like dropping safety drivers. I suspect at Waymo they had serious talks about putting out of Phoenix, in spite of the huge investment there. But in the end, changing towns would help but not enough. Everybody is slowed down by this. Even an injury free accident that could have had an injury will be problematic -- and the truth is as the volume of service increases, that's coming. It was terribly jarring for me to watch Waymo's introduction video. I have set it to play at one minute, where they do the big reveal and declare "Introducing the self driving service." The problem? The car is driving down N. Mill Avenue in Tempe, the road on which Uber killed Elaine Herzberg, about 1,100 feet from the site of her death. Waymo assures me that the film crew just selected the bridge for the scenery and was unaware of the significance of the location (besides, those who live outside the area or who did not study the accident may not recognize it) but it soured the whole launch for me. Wow, you're right! I thought that bridge looked familiar but shrugged it off since I've not spent any time in Phoenix. However, you may recall I did a lot of detailed forensics on the accident footage and now that you mention it, that is the bridge! 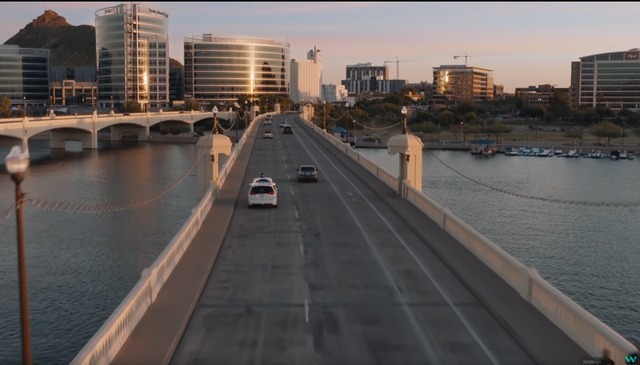 I figured maybe they have a lot of similar bridges, but, no, that's it right where the speed limit sign was exonerating the Uber's car's speed. That's pretty tone deaf! And now they are constant, so I needed to add some more hoops, sorry.